A multi-university team of researchers has engineered a unique multilayer material designed to achieve extraordinary superconducting properties — in particular, the ability to transport much more electrical current than non-engineered materials. The team, led by Chang-Beom Eom, the Harvey D. Spangler Distinguished Professor of materials science and engineering and physics at UW-Madison, includes experts from the University of Wisconsin-Madison, Florida State University and the University of Michigan. Superconductors, which presently operate only under extremely cold conditions, transport energy very efficiently. With the ability to transport large electrical currents and produce high magnetic fields, they power such existing technologies as magnetic resonance imaging machines and Maglev trains. They hold great potential for emerging applications in electronic devices, transportation, and in power transmission, generation and storage. 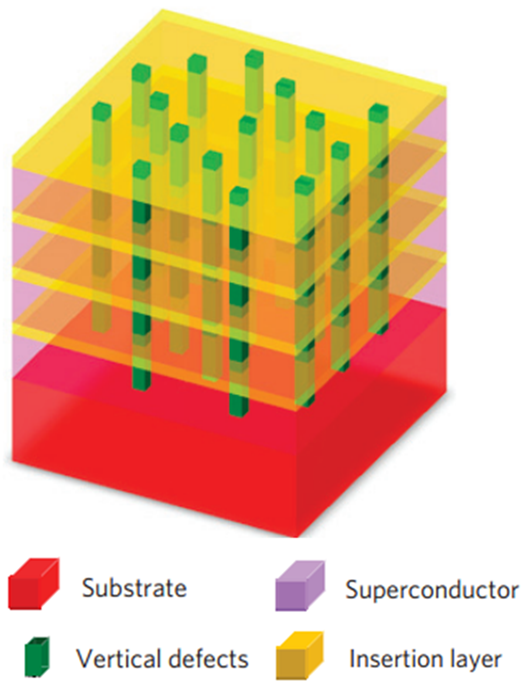 Carefully layered superconducting materials are increasingly important in highly sophisticated applications. For example, a superconducting quantum interference device, or SQUID, used to measure subtle magnetic fields in magnetoencephalography scans of the brain, is based on a three-layer superconducting material. Read more: Pushing the bounds of superconductivity | KurzweilAI.